Hello, today I’m doing a Seiko Alpinist review. The Seiko Alpinist as it’s known is part of the Seiko SARB collection which are known for their high quality timepieces. I hope you enjoy this Seiko Alpinist SARB017 review below. It’s a shame the images really don’t do the green sunburst dial the justice it deserves as it has a really beautiful finish to it. The Seiko Alpinist features this simple easy to read display with gold-tone numerals and hands that go very well with the green background. It’s in a dress, military/field style and features an inner bezel which displays compass directions. The date display at the 3 o’clock position will also come in handy. 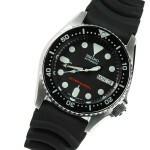 The casing of the Seiko Alpinist is made of a strong stainless steel and has two screw down crowns. The Seiko Alpinist features a very high-quality sapphire crystal glass. This type of glass has a Mohs hardness rating of 9 making it extremely scratch and knock resistant. This is something you would expect from high-end Seiko timepieces like the SARB collection. At the heart of the Seiko Alpinist is a 6R15 movement. 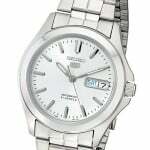 The Seiko 6R15 automatic movement has 23 jewels and beats at 21,600 BPH giving it a really smooth 6 ticks per second. It has an impressive 50 hour power reserve and can be manually wound and hacked. The casing of the Seiko Alpinist measures 38mm in diameter not including the crown. The thickness of the casing comes it at approximately 11mm. This is a fairly decent medium size that should prove popular for many. 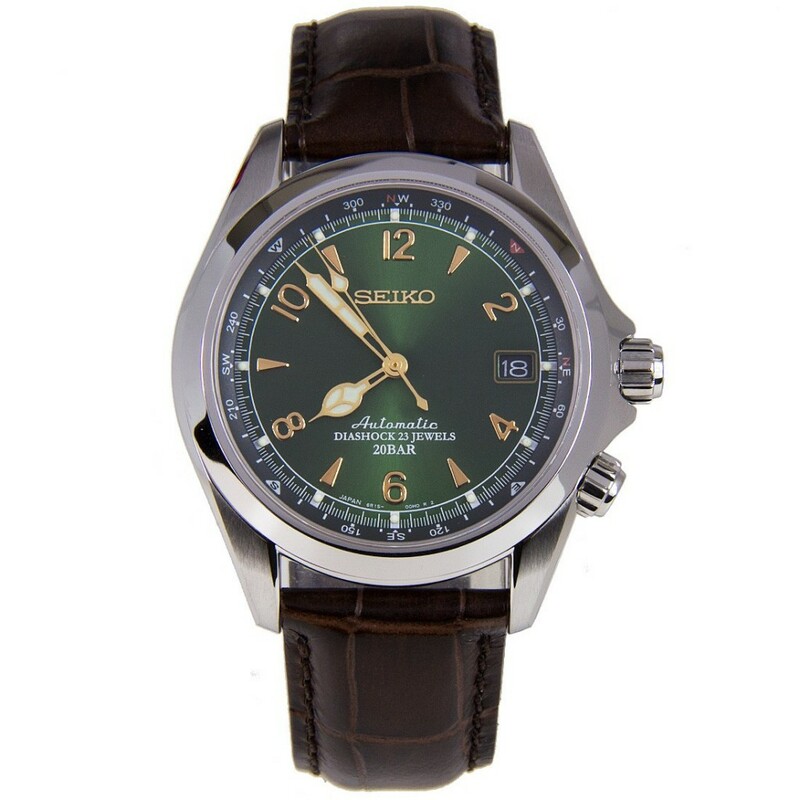 The Seiko Alpinist strap is made of a soft and comfortable brown genuine leather. It measures 20mm in width which is nice and in keeping with the size of the casing. It fastens with a standard buckle style clasp. The strap can also be replaced if you choose to do so. The Seiko Alpinist actually has a very good water resistance rating. A 200m or 20 bar rating makes this watch suitable for professional marine activity, serious surface water sports and skin diving. Case: Stainless steel casing, sizing diameter: 38mm and thickness: 11mm. Dial: Analogue display. Sapphire crystal glass window lens. Water Resistant: A water resistance of up to 200m / 20 bar. Overall this is a very high quality timepiece from Seiko, it has an excellent automatic movement and features a very strong sapphire crystal glass. It’s pretty easy to see why the Seiko Alpinist have proved to be so popular. I like to stick to listing retailers that I’ve actually had experience buying from in the past. 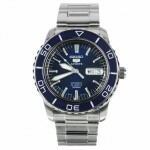 Below I’ve listed some of the top places to buy this watch from, check all for the best price. Variations of this watch include: Seiko SARB017. I Hope you enjoyed this Seiko SARB017 review. Let me know what you thought of today’s Seiko Alpinist review below. Find more watch reviews below.